In a career spanning three decades, Laurence Anholt has written and illustrated more than 200 picture books for children. 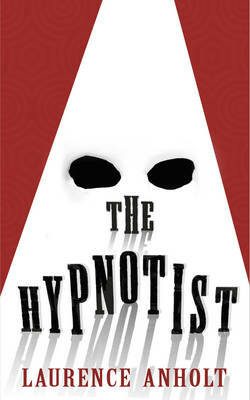 THE HYPNOTIST is his first full-length novel for a YA and Adult readership. Since publication in October 2016 The Hypnotist has received rave reviews including The Guardian, TES, Buzzfeed and Achuka. The book has been officially endorsed by Amnesty International and shortlisted for several awards including the Southern Schools Book Award. In June 2017, The Hypnotist was the winner of the prestigious Historical Association Young Quills Award. Set in the Deep South of America in 1963, this is a powerful story about Race and Love and Hope. “…In the dead of night, Pip is plucked from an orphanage and hired as a farm hand. But Pip is black. The farmer and his wife are white. And this is 1960’s America, where race defines you. Part thriller, part love story, this extraordinary debut novel looks at where life can take you when your expectations are great. If you have enjoyed The Hypnotist, a positive Amazon review would be much appreciated. Pip had been awake for hours when the flashlight snaked across the dormitory floor and picked out his bed and his face on the pillow. While the other boys slept, Pip pulled on his clothes and walked across the linoleum into the corridor. He carried his book in one hand and his boots by their laces in the other. There was a cluttered office outside the dormitory with windows on three sides, where a TV crackled and the two men were drinking whiskey. Pip stood blinking in the flickering light as Mr Zachery turned him about by the shoulder like a cut of beef. The old man’s beard was yellow with nicotine and the teeth were black within. It reminded Pip of something foul – a piss-hole in the snow. When he had signed, the man named Zachery pulled out a wad of dirty dollars. Licking his fingers theatrically, he began to count – ‘Twenny, twenny-farve, thurty, thurty- farve, fawty, fawty-farve . . .’ – until there was a jumbled hillock on the table. Then there was more counting and recounting until the men shook hands and the money was shovelled into a drawer. Finally Pip was pushed gently but firmly from one man to the other, as casually as you might pass on a pair of discarded corduroys. Pip squatted on the office floor, his thin legs trembling as he worked on his bootlaces. Then he rose to his feet and followed Mr Zachery like a gangly calf at an abattoir along the silent corridors which he had mopped so often; down the granite steps, thirty-eight in all, each spangled like a starry universe, and into the courtyard of the St Joseph Poor Boys’ Orphanage, where they were consumed by the drizzle of the night. Pip carried no bag but he shoved his precious book deep inside his jacket. He watched Zachery climb into the cab of a battered brown truck. The engine chuntered, then the old man leaned across to push open the passenger door. But Pip did not move. The inside of the cab reeked of tobacco and dog and old man. Zachery peered through the murky windshield and the truck jolted forward, through the great iron gates, past blind tenement buildings and black warehouses, trundling through slumbering clapboard suburbs and into the lonely countryside. Pip tried to settle but the seat was cold and rough, with ripped leather and horsehair stuffing, and all the while the hound, Amigo, inspected each part of his body in turn, finishing by thrusting a wet nose deep within his ear. As they drove, Pip’s fingers stroked the cover of his mother’s book, soft and worn by years of his unconscious caress. The only sound was the groaning and thumping of the wipers and a sniffing and coughing from Zachery. After an hour the small truck entered a huge forest, where the weary headlights created dancing shapes amongst the foggy trees. In Pip’s imagination the shadows took on the form of dead men concealed behind every trunk, who lurched violently towards the windshield waving their elastic arms before disappearing again and again into the blackness. Why could Zachery not see them? Pip stared at the old man’s cadaverous face, illuminated by the glow of a cigarette, and imagined that he was one of them – driving deeper and deeper to his dead man’s lair. Pip was a fast learner and glad of a diversion. With some pride he handed his effort over for inspection. Zachery turned the cigarette in his hands, sniffed at it, struck a match, exhaled a vast cloud of blue smoke, and they lurched on into the sodden night. Pip had never spoken of that fateful Sunday. Not to a soul at the orphanage, or to the childcare officers who had taken him there. But something about this strange night opened him up and he began to relate the tale of the drive to church, which started so happily, with hymns in the car and excited talk of his baby brother or sister curled snugly within Mama’s belly. Pip heard his own voice far away, describing the details of how he had crawled into the very back of the station wagon to retrieve his book, so that when the signals failed and Papa drove straight into the path of a speeding train, Pip had miraculously survived, while his mama and papa had died in an instant, taking with them the sibling he would never know. Having no other relatives, Pip had been passed by the preacher to St Joseph’s where, although he had not been mis- treated, he had waited and waited for something to happen, never knowing exactly what it would be. If he had been older than ten years when he arrived at the Poor Boys’ Orphanage, he might have been aware of some injustice at being labelled poor. Pip’s parents had not been poor – his father ran a busy general store and they had lived in comfortable rooms at the back of the schoolhouse where his beloved mother was head teacher. Pip’s father had never trusted banks, and after his death, although the people searched and searched, no savings could be found. The store and eventually the schoolhouse were sold, but a number of parties came out of the woodwork claiming ‘evidence of unpaid bills’ or debts, which had ‘accumulated interest’. By the time they had taken their share and the pastor had paid the triple funeral bill, there was nothing left, and young Pip had been sent away with only the clothes he stood up in and Great Expectations in his hands. And now he was almost fourteen years old, and when he looked back in later life, Pip would realize that he had entered a kind of limbo in the orphanage years, like a chrysalis wintering in an attic. In the brief moment before he fell asleep, Pip imagined how he would tell the story to his father, getting every detail just right, and how sorry they would be for that poor family. Pip dreamed of rumbling and jolting and an ever- increasing weight on his legs. He awoke to a ghostly dawn and the horrible realization that the story was true and he was that orphan, and that the weight on his legs was the sleeping dog, Amigo, who had drooled a copious quantity of saliva across his knees. His body ached, his throat was dry, his belly groaned for food. Then it came to him that the bearded man at the wheel, with drooping eyelids and cigarette hanging from lip, was named Zachery, and that for ‘severnty-farve dollars’ he had bought his life. They lumbered to a stop at a gas station next to an all- night diner, seemingly nailed together with advertising signs. The rain had evaporated and a fierce heat was building like a threat. Laurence talked about his own extraordinary family history on a BBC Radio 4 ‘Four Thought’ programme first broadcast on 24th August 2016. In many ways, his family’s tale of prejudice and alienation was the inspiration behind THE HYPNOTIST – as explained in the Author’s Note at the back of the book. “I wanted to let you know that I LOVED ‘The Hypnotist’, I started it and couldn’t put it down until I finished – although set in the 60’s it is so-o-o relevant to what’s happening today. It seared itself into my heart and brain . I’ve just read The Hypnotist. I loved it – what a rich story you have told! If you would like an Amnesty endorsement on the book we’d be honoured to provide one. Pip, a 13 year old young black orphan is bought from the orphanage by Zachary an elderly farmer. Pip can read, as his parents were educated, his father ran a store and his mother was the head teacher at the local school where they lived. Both his parents were killed in a car accident when Pip was 10. After their deaths, ‘creditors’ came out of the woodwork claiming ‘debts’ to be paid and Pip ended up in the orphanage. It is because Pip can read, that Zachery wants him to look after and read to Lilybelle, his morbidly obese wife who because of her size, is unable to get out of bed or to look after herself. At the house, Pip meets Hannah a native American Indian girl who cooks and helps around the house and who has secrets from her past and her present that make her mute and for the first time starts to feel love. Living nearby is Jack, an Irishman with the skills of a hypnotist who has recently taken up a post as Head of Neurological Research at the local University. Jack soon recognises that both Pip and Hannah have something special about them and starts to look out for them and to develop their education. The blurb on the book says that ‘this is a story about a hypnotist, an orphan and a farmers son and about friendship, hope, race and love’. It is all of these and so much more. It is a remarkable story and a thoroughly compelling read which I was unable to put down. Laurence Anholt is a well known and much loved picture book author and illustrator. With this book he has definitely proved that he is also able to write YA novels that young people will definitely want to read. Summary: Powerful story set in the Jim Crow Deep South, exploring prejudice, PTSD and hypnotism. Delightfully riffing off Great Expectations, it speaks of the redeeming power of love. orphanage ever since. He has only one treasured possession – a battered copy of Great Expectations by Charles Dickens, given to him by his schoolteacher mother. That’s how Pip got his name and he has a vague but treasured memory of his own father telling him of his own great expectations. It’s thanks to his ability to read that Pip finds himself released into the care – well, sold, actually – of old Zachary, who wants a companion for his bedridden wife, Lilybelle, at Dead River Farm. Lilybelle likes being read to. Oh! I found The Hypnotist to be such a compelling read. Told by both Pip and Jack Morrow, the professor, we feel strongly the oppressive structures of segregation from two points of view – via the oppressed themselves and via the shock and horror of outsiders. Pip navigates as best he can while Jack tries to subvert as best he can. But both live in fear of the dangerous and unstable Erwin. We also hear from Hannah, who may be mute, but sings beautiful songs to herself in her head. I don’t want to say too much about the storyline itself for fear of spoilers but it’s all a wonderful blend of kitchen sink realism, accurate historical detail and an atmospheric dollop of magic realism. Anyone interested in hypnosis will find it fascinating, too. Laurence Anholt (along with his wife, Catherine) is best known for his many, wonderful books for younger children. One of our favourites is One World Together. The Hypnotist is his debut novel for YA readers – but really, you couldn’t tell. It’s a very assured piece of writing. It draws you in from the very first page and keeps your attention until the last. I would recommend reading the afterword, which explains the way in which avoiding one story led Anholt to this story – but that both stories have the same impulse: to explore oppression, prejudice and what it is to be powerless. The Hypnotist does a wonderful job on all these things. And how could you not be well-disposed towards any YA novel that riffs on Dickens?! Laurence talked about his own extraordinary family history on a BBC Radio 4 ‘Four Thought’ programme first broadcast on 24th August 2016. I didn’t mean to write The Hypnotist. I wanted to tell a different story all together. The story I had in mind traced my own family history, beginning way back in Persia in the 1700’s when our first known ancestor, Jacob Sjoesjan led his bedraggled family across the deserts and mountains to Europe… just like so many poor refugees today. Jacob and his family were Jews in a society that had turned against them. It has always been my worst nightmare to find myself in a world in which the very authorities that are meant to protect you – the police, the government, the army, the law, the educators, are on the side of the mob that is baying for your blood. You are powerless. There is nowhere to turn. That dystopian scenario often begins with bizarre rules designed to intimidate and humiliate: you must go here, but you cannot go there! So Persian Jews were banned from all but the most menial jobs; theatres and public baths were closed to them; they were not allowed out in the rain or snow in case impurities leached from their skins and infected others. And here’s a familiar one – Jews were forced to sew yellow stars onto their clothing, so that people could be sure they were discriminating against the right minority. Next comes the violence – the smashing of glass in the night, the splintering of doors as uniformed bullies demand documents, which you never seem to have. Unsurprisingly my ancestors decided to flee and I bet it was a terrible journey. I wouldn’t be surprised if some of them died on the roadside – the young ones, the old ones; that’s what usually happens. After many months, the Sjoesjan tribe rolled up at the Dutch-German border. They were dirty and hairy and kind of foreign-looking, as many refugees are. In my imagination it was a snowy night and the official who demanded their names couldn’t understand a single word they were saying. What old Jacob was trying to convey was that Jews didn’t have surnames where they came from; they were named after their town of origin – Sjoesjan was just a funny way of spelling Shushan, their hometown in Persia. All the guard could think about was his warm bed and his warm wife. He stamped their papers and, to save further confusion, replaced their funny name with the sensible name of the border town where they were standing. That town was called Anholt, which suggests to me something like ‘stop and hand over your papers’! Jacob’s family took their shiny new surname and settled into the horizontal and tolerant Netherlands. They were a creative lot and over the generations, they became art dealers and artisans, including a wonderful painter named Jozef Israëls, who was much admired by van Gogh. I wanted to write about Jacob and Jozef, and the many powerful women of the family. I wanted to mention my great-grandfather, Martin van Straaten who went down with the Lusitania in 1915, so that when his remains drifted onto a beach in Ireland, only the jet-black ring on his bloated finger identified him. My sister wears it to this day – the ring I mean, not the finger. Hitler’s armies had invaded Holland and the cancer of prejudice, which never really goes away, oozed through the beautiful canals of Amsterdam like a foul oil slick. Up went the cry in the Jewish neighborhoods – ‘Here we go again!’ Along came the bizarre rules: you are allowed here on Tuesdays, but not there on Fridays. You had to sew on the old yellow star for easy identification. And when they heard the snarling of Alsatians and the smashing of shop windows, many of my father’s family went into hiding in cellars and attics, exactly like Anne Frank’s family. Those who stayed were herded into cattle wagons and freighted to concentration camps. Among the 6 million Jews, homosexuals, disabled people and Roma who were murdered by the Nazis, more than 60 members of the Anholt family also perished. My dad was lucky… at least he thought he was lucky. His parents had contacts in London and they got out before things turned nasty. My father thought he would be safe, but… you know how these stories go; the nightmare had just begun. Gerry was drafted into the British Intelligence Corp and took part in dangerous missions in occupied France, Holland and later, Germany; for which he was ‘Mentioned in Dispatches’. Like many Dutchmen he spoke several languages, so part of his job was to translate the often-brutal interrogations of captured SS officers. My father didn’t often talk about these events, and it wasn’t until the last years of his life that I learned about the worst horror of all – in 1945, that olive-skinned black-haired boy was amongst the Allied troops who liberated the death camp of Bergen-Belsen. He said that although the stench hung over the nearby town like smog, the residents denied any knowledge. I think my father lost a lot of things in there – his youth, his optimism and even a sense of joy. What I know for sure is that the skeleton-people wandering naked amidst the heaps of bodies haunted his dreams forever. These were his own people. When it was all over, Staff Sergeant Anholt tried to forget what he had seen. He married an English girl. He became a Christian. They started a family. But of course my father was not ready to raise children of his own. What he actually needed was someone to look after him. We spent some years back in Holland and then at nine years old, I was packed off to an English boarding school, which I detested with a passion. That was the story I planned to write. I wanted to mention that although he was not a great dad, my father was a deeply tolerant humanitarian who despised prejudice of every kind. Touchingly, he held a special fondness for Germany, which he visited many times. The problem was that some of those themes just would not go away; the stuff about powerlessness and prejudice – what it feels like to be defined by a yellow star, your gender, your sexual orientation, or the colour of your skin… what it’s like to live in that hellish world for which I have no name; the place where there is nowhere to turn. I began searching the history books for other less personal examples. And it didn’t take too long. Then comes the fear. The rumbling vehicles in the night, the lynch mob waiting at the corner. There’s nowhere to go for help because the very people who are meant to protect you are pulling on their jackboots or their scary pointy hoods. The point I am making is that although The Hypnotist is set in the Southern States of America in 1963, it could be anywhere; anytime. For the record, I love the United States and have many friends and relatives in that great country; indeed my own daughter worked for several years at the United Nations in New York City. There is not one country on this planet that does not carry the bloody stain of prejudice and oppression. It’s what we tribal humans do, and always will do until we wake up and look in the mirror. It is not just the victims themselves who suffer – the ripples spread through the generations. The horror that my father witnessed was passed on through his inability to nurture. When I write about Pip in the orphanage, I only need to close my eyes and remember the iron bed in the cold dormitory of my boarding school. I was not an orphan, but sometimes I felt like one. And perhaps the culture of bullying and the regular canings were my personal glimmer of that nightmare in which the men with the power are your enemies. That’s all a bit miserable isn’t it! But I’m one of the lucky ones – I have a wonderful life, free of war and prejudice. Those small hardships were nothing more than the grit in the oyster shell, which every creative person needs. My father did pass on many positive things. Chief amongst them is a dream of tolerance, equality and mutual respect. When they stayed at the Kozy Kabins Motel, Jack lay awake watching a historic moment on TV. If you know nothing about the March on Washington of 28th August 1963, I urge you to check it out! Don’t let another day go by without hearing the ‘I have a dream’ speech, which brought Jack Morrow to tears. Martin Luther King’s dream was that one day, Black and White; Jew, Muslim and Christian; Gay and Straight; Woman and Man, will join hands and sing together, ‘Free at last! Free at last! Thank God Almighty, we are free at last!’ I hope it’s your dream too.